Hey there folks. Happy CSA day. 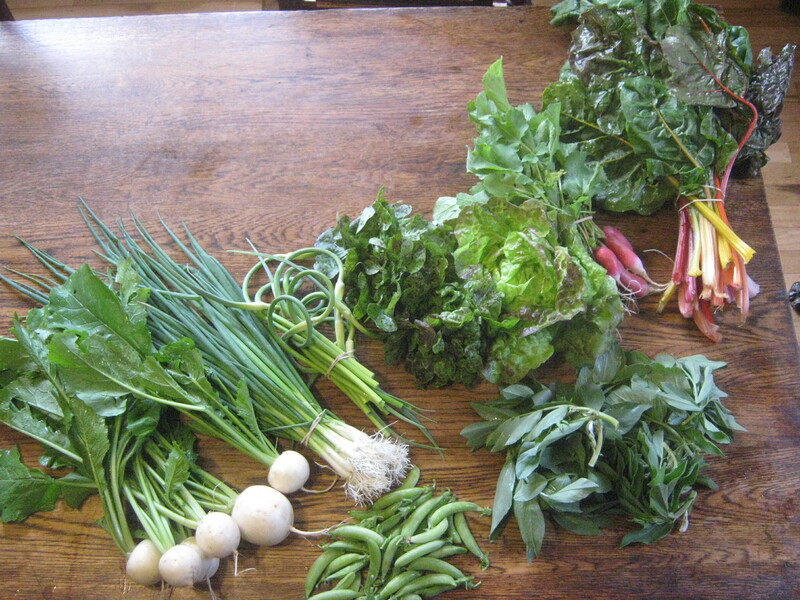 Today’s share is similar to Monday’s (6/10) but without kohlrabi, and with garlic scapes and radishes. So take a look at the 6/10 post for most of the veggie info. Garlic scapes will be coming to the Monday folks this coming Monday 6/17. Garlic scapes (aka whistles or whips) are the immature garlic flower stalks. They are tender and very good grilled or sauteed. When cooked they have a nice mellow garlic flavor that’s not nearly as intense as garlic cloves, and an almost meaty texture. You can also pickle them (see here) or do seven other things with them here (including garlic scape pesto!). Yesterday I transplanted out the peppers and eggplants into the field in a hailstorm. OK it was a rain storm with a little bit of hail. They’ll probably take a little while adjusting to their new slightly harsher environment but they were all looking fairly happy today after a good bit of rain. Tomorrow I hope to put in the rest of the winter squash starts which I purchased from Gales Meadow Farm since my seeds kept getting eaten by rats before they germinated. If you’re ever at the Hollywood Farmers Market, check out there stand – they have excellent starts and very interesting varieties of produce. Once the squash is in, most of my large plantings for the year will be done! Then the work shifts to smaller plantings, weeding, trellising, irrigating, and of course good old harvesting. In hoophouse news, the trellises for the tomatoes and cucumbers are up and the tomatoes have been pruned to two leaders (vines) per plant, each of which will get wrapped around a vertical twine as it grows. This past Sunday, I joined the NE Urban Farm Bicycle Tour as part of Pedalpalooza. An amazing 140 riders showed up to tour Bluehouse Greenhouse, Albina Farms, Sowing Circle Farm, Ariadne Garden, Sideyard Farm, and Cully Neighborhood Farm. It was a total blast and felt very Portland. Thank you to everyone who came out and made the ride so fun.